Here is another shared post from PI of Products! It is a giveaway too, so be sure to enter. I really like the slicer and the Dipping Cone! Be sure to read on to find out more about the Joie Shop. This afternoon we will be reviewing (and giving away, so make sure you keep reading!) a couple of items from the Joie Shop. Now, I have to tell you, we think the Joie Shop is really neat. There are all sorts of neat kitchen gadgets that help save time and make things easier. First up is the Purple Dual View Measuring Cup. This is now my favorite measuring cup! It is nice and easy to read, and I LOVE that the measurements are marked on both the outside and the inside. 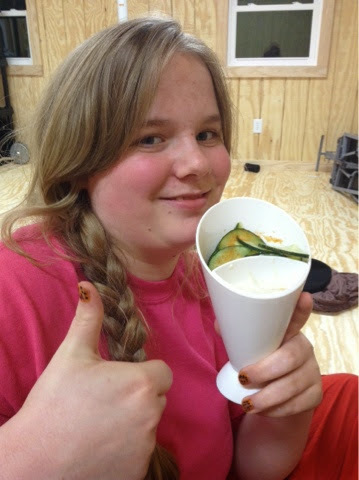 No more having to turn the cup and then wait for it to settle again! 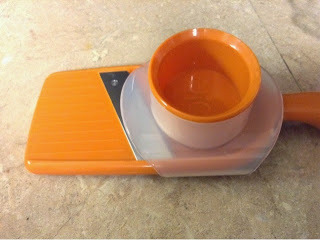 Next, I received a Orange Joie Slicer with Guard. 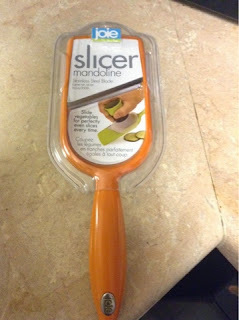 This is really useful for slicing cucumbers, small potatoes, carrots, etc. You slide the veggie across the blade and the results? Perfectly sliced veggies! One of my favorite features is that there is a protective guard so that even my little sis (she makes my mom's salads a lot) is able to use it without slicing her fingers! Okay, so this is the last product we will be review, and my personal favorite. The Dipping Cone! 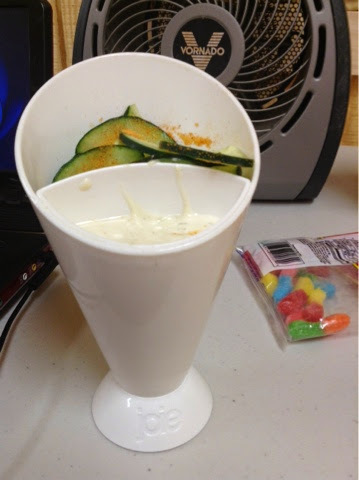 This comes in two sections (one for your food being dipped, and one for your dip). Think of all the possibilities, veggies (cucumbers, carrots, etc.) and ranch, french fries and ketchup, apples and peanut butter, etc. This is PERFECT for late night snacking, snacking on your bed/couch, etc. Okay, aren't those nice?!? 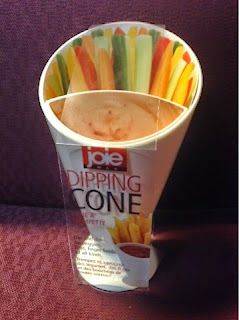 These are well worth purchasing from the Joie Shop website. You can also Like them on Facebook and Follow them on Twitter to stay up to date with their latest news. The Joie Shop is a #1 Company! What do you think neighbors? Are you interested in these products from the Joie Shop? The winner of this giveaway will receive one of each of these. Now how neat is that? Thanks for stopping in today for a visit. Be sure to come back soon. I love the Oink Oink-Salt & Pepper also. I like the honey pot and dipper. I'd like to have one of the Veggie Steamers. They have lots of neat products! the Hand Peeler - Green looks neat! Might be the answer to hand-cramps..